Mothers are not rare to find. Good mothers are. Have you ever wondered what goes on to make a good mother? 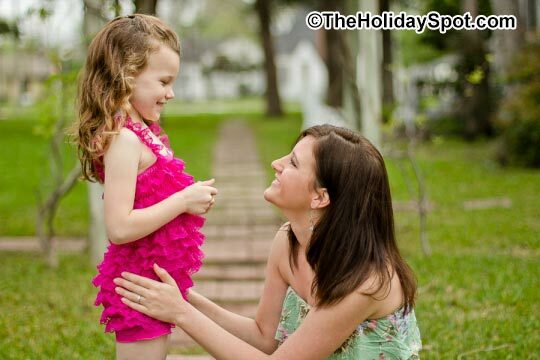 TheHolidaySpot provides you with the answer. Read our splendid article on mothers and good mothers. Get to know about what lies in the heart of an ideal mother. If you like this page (and we don't see why you won't), please click here to refer it to your friends and acquaintances. Have a great Mother's Day! What makes good mothers? It is a pertinent question whose answer cannot be contained within a few words. Mothers comprise of a bundle of emotions that sometimes defy reason. So this goes out to all the mothers who have kept awake all night with their sick toddlers in their arms, constantly uttering those compassionate words, "It's OK honey, Mommy's here." For those who show up at work with milk stains on their dress and diapers in their handbags. For those mothers who cannot restrain tears from trickling down their cheeks when they hold their babies for the first time in their arms; and for the mothers who give birth to babies they'll never see. For the mothers who gave homes to babies and gifted them a family. For the mothers who yell at their kids who clamour for ice cream before dinner. For the mothers who taught their children to tie the shoelaces even before they started going to school. even though they know that their kids are nowhere around. For the mothers who silently shed tears for their children who have gone astray. For all those mothers whose heart aches to watch her son or daughter disappear down the street, walking to school alone for the very first time. For all the mothers of the victims of all these school shootings, and the mothers of those who were involved in the shooting. For the mothers of the Survivors, and the mothers who sat in front of their TVs in horror, clinging to their child who just arrived from school safely. So, this is meant for all the young and aged mothers, working mothers and housewives, married mothers and the single mothers, those with money and without and for those without whom life would have been insufferable. Wish you a very Happy Mother's Day! !